An interview and mini mural series exploring the explosion of mass incarceration in the United States. One of the most troubling issues in the United States today is the rapid growth of the prison population. The City of Philadelphia Mural Arts Restorative Justice program is shining a light on this problem through our Beyond the Wall series. The project, initiated by artist Eric Okdeh and the inmates participating in the Mural Arts Program inside SCI Graterford, included community discussion groups held throughout the City, and a new series of interviews and mini murals by Okdeh. 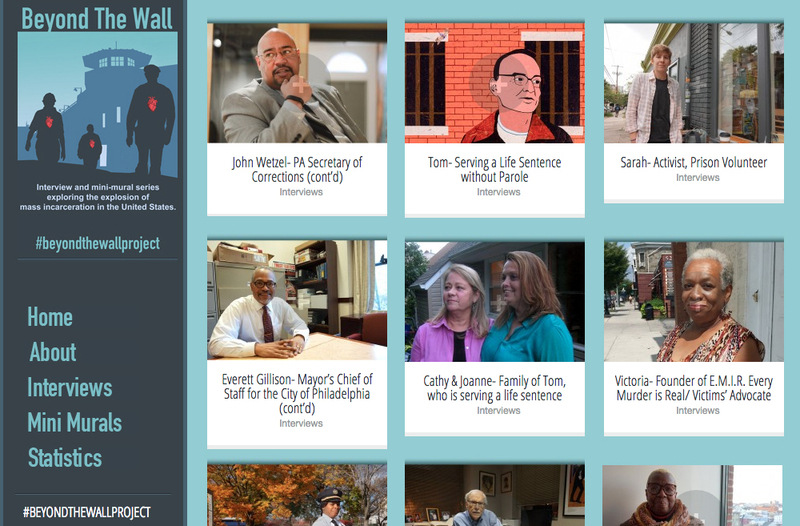 The mini murals feature inmates, formerly incarcerated individuals, attorneys, criminal justice professionals, Corrections Officers, politicians, academics, advocates and community members, and include statistics and quotes from those interviewed about this troubling issue. The project website, beyondthewall.muralarts.org, features expanded versions of these interviews, along with photos of the projects as they develop and get installed in locations throughout the city. The various mini murals have appeared in 5 separate exhibitions as of this date: The Philadelphia Art Alliance, Drexel University's Connelly Center, Eastern State Penitentiary, The Philadelphia Mural Arts Program, and Philadelphia's City Hall. If you want to be a part of the dialogue, and see the contributions of others use #beyondthewallproject on Facebook, Instagram and Twitter.